My “Picturebook Exhibition” consists of all the original paintings belonging to one book or story. I paint on Belgian linen portrait canvas. I transport the paintings mounted on boards with mats and packed in a cardboard box. I exhibit them on chairs in a classroom, a school library, a music room, an arts and crafts room, or a mediatheque. 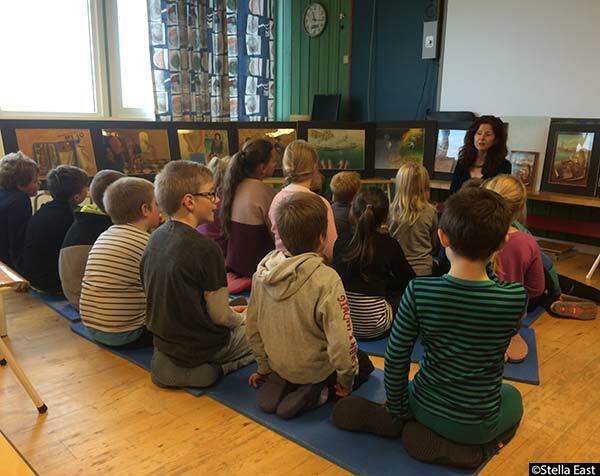 I then hold a presentation, sitting with the children in front of the paintings. The ideas in my presentation are partly inspired from questions and talks I have had with children since I began touring in 2000. I tell about how each painting begins in the mind, and the sketch is the first stage of that process. I demonstrate how pictures partake in the telling of the story through the use of composition, colour, content, and research. I present altogether four books including the one I exhibit, touching upon themes such as the Renaissance, Buddhism, boys and girls, rich and poor, fantasy and reality, painting and photo, and clothes, architecture and woman’s culture from the “old days”. 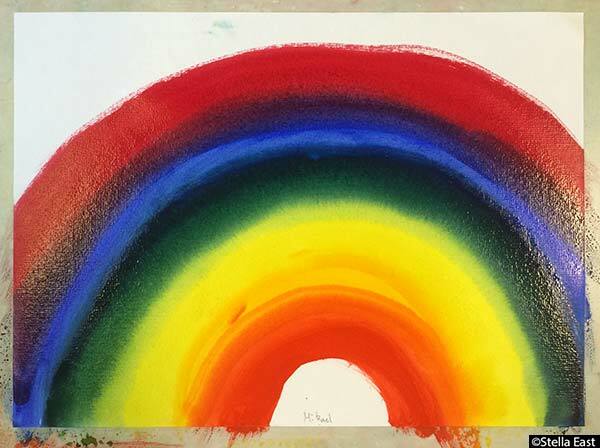 During the “Rainbow Workshop” the children use the same pallet as I use in my paintings to create a rainbow on wet paper. 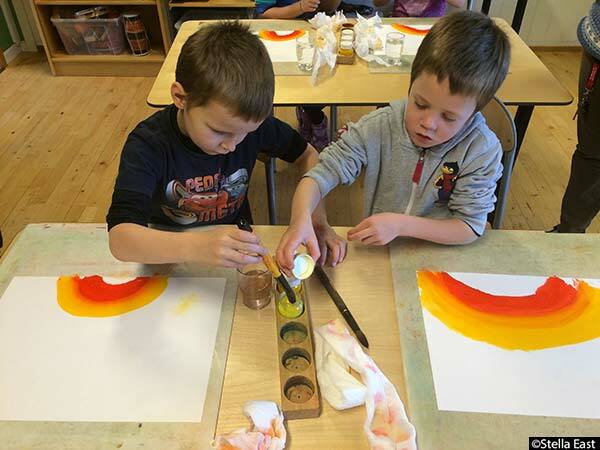 The main goal is the experience of each child as they create their own orange, green, and purple. Each rainbow is unique and each is a success. 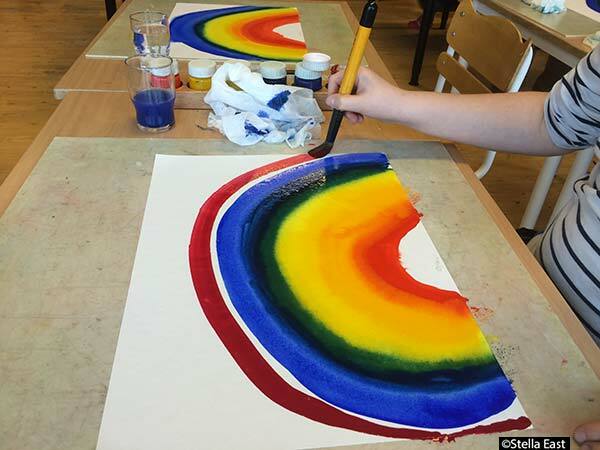 The workshop is about learning colour theory through experience, whereas the presentation demonstrates how colour partake in a composition and picturebook story. Schools seem to be using fewer resources on arts and crafts. 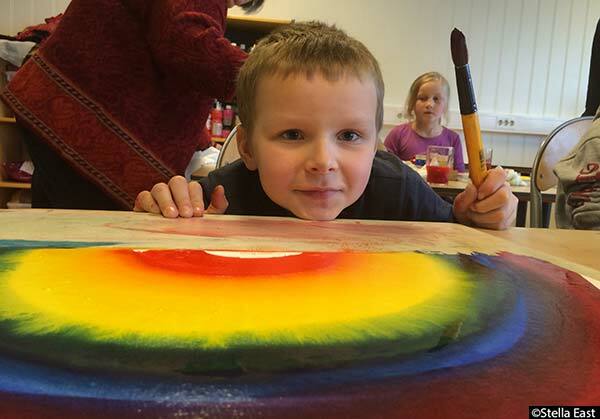 Many children have therefore never experienced the result of mixing clear, clean, highly pigmented colours. I believe that understanding and experiencing colour is as important as understanding math or music. Colour has its own natural laws, as math and music have. Colour theory and painting are excellent ways to understand these laws. 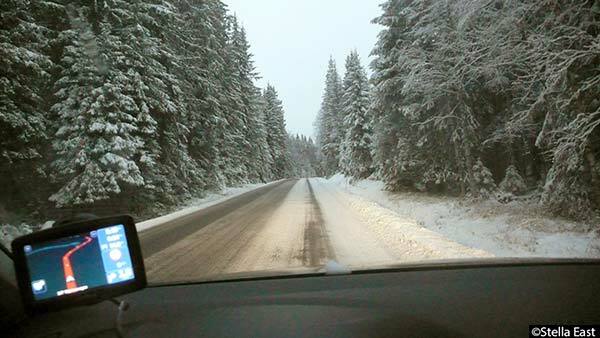 Driving from Fryal school, Oppland with GPS 17.11.2015. I am on the road with all my paints and paper and paintings by 8:30am. The plan is to arrive at Vestsida school by 9:30am and start the exhibition/presentation/workshop at 11am. There is frost along the sides of the road and I hear on the radio that a car is on fire on the very road I am driving on. A police roadblock sends everyone on a detour. 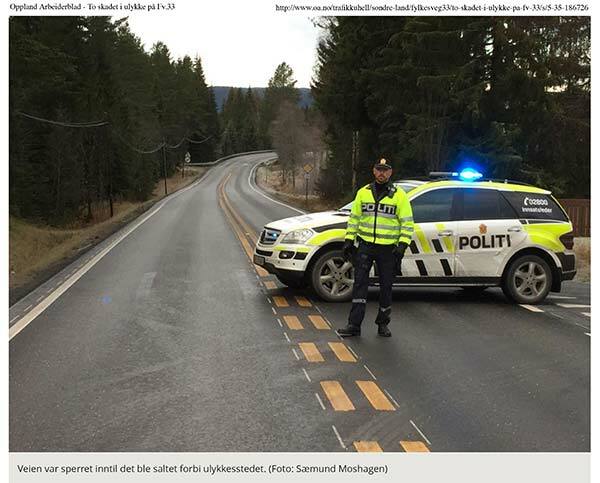 “But will I find a bridge to cross the Randsfjorden fjord on this detour?” The two policemen do not know. After about 10km the car behind me offers to lead the way. A deer jumps over the road, passing in front of our cars. I call the school and explain that I will be late. They already know about the car on fire. A boy had seen it on the internet. I arrived at 10 o’clock. With help from one grown up and 3 clever girls, the classroom is transformed on time – and this is in spite of a fire, police, a deer, and a detour! And how might a classroom transformed into a workshop/exhibition look like? : 15 to 30 work spaces, with tables and chairs, are arranged two and two. Each work space has clean brushes, paints, and painting boards, as well as glasses of water for washing and paper-towel for drying. Twenty or so sheets of watercolour paper lie waiting, soaking in a tub. My 14 paintings and books are arranged horseshoe shape on chairs. 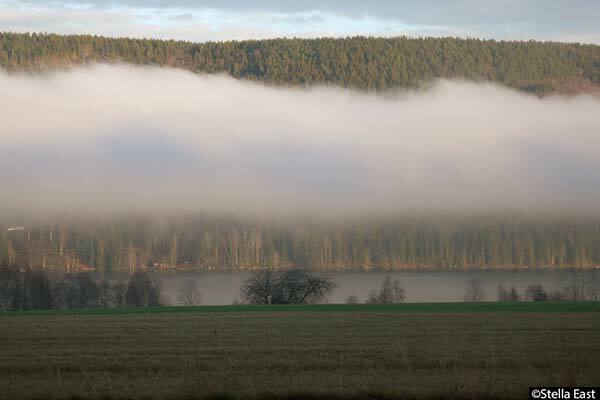 View from Vestsida school, Oppland county. Normally I would have two sessions in a day, but today there will be only one. All of Vestsida school’s 17 students with 1st, 2nd, 3rd, 4th, and 5th graders attend. The secretary Eli Muldbakken takes many excellent photographs, some of which can be seen in these blogs. 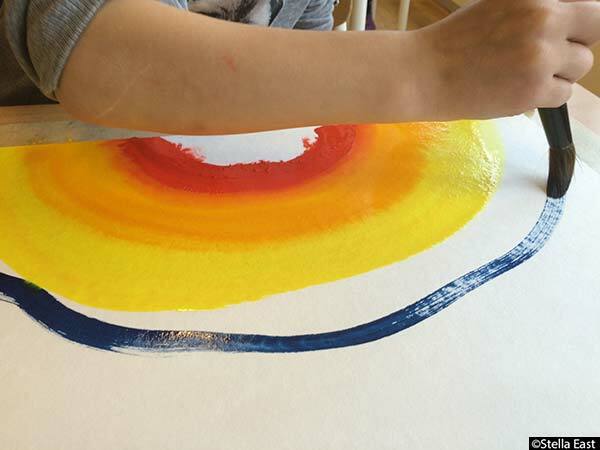 The teachers share out the watercolour paper and change the washing water for the brushes. After the rainbows have been painted, the tables, boards and brushes cleaned, and the paintings and paints packed, I received a box of truffle chocolates. Vestsida school was a fun and inspiring place to start this tour. 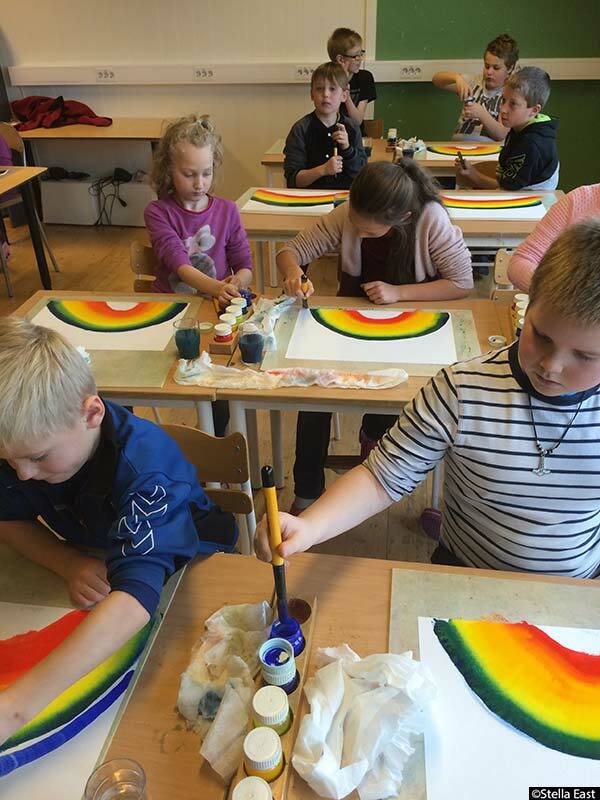 Tags: Den kulturelle skolesekken, The Paint Box, The Cultural Rucksack Oppland, and Oppland.